Have you ever considered what an amazing time it is to be a hopeful adoptive parent? There are unprecedented resources and opportunities available to help you meet all your family goals—tools that even a decade ago were not available to adoptive parents. But with all these new opportunities and technologies come a lot of decision making. Are you going all in on Instagram based on the recent hype? Or are you sticking with a more traditional presence on a platform like Facebook? Maybe you are thinking outside the box and running ads in newspapers, or perhaps you are doing some combination of all these. In this article, we’ll discuss some of the many ways that your family can maximize its online outreach so that you can get to the real challenge as soon as possible: parenting! Advantages: Tell your story in an in-depth, customized way with photos and videos and just about anything else you wish to add. If you have an eye for design, you can easily create something interesting and effective that will really engage your visitors. Plus, with all the do-it-yourself web services available now, a great-looking and mobile-friendly site is totally within reach. Disadvantages: Build it and they will come? Hardly. Even the most well done website can get lost amongst all the hundreds of adoption websites out there. And worse still, there is no guarantee that Google will ever rank your website in adoption searches. In fact, they probably won’t. That means you alone will be responsible for getting the right visitors to view your website. Last word: A custom website is great if you can build it yourself and afford to advertise it. Skip this option if you cannot. Advantages: This is a free way to publish your story and access a large audience interested in adoption. Many adoptive parents have successfully connected through Facebook or Instagram, so it can work. Disadvantages: Using hashtags or updating frequently generally isn’t enough. As with a personal website, it is hard to get noticed without doing some paid advertising so that more people see your posts. And the popularity of these platforms means that there are many, many other families doing the exact same thing. Last word: If social media is your thing, then these platforms are still the best option. They will require steady updating to be effective. Definitely try it if you feel like you can dedicate the appropriate time (and budget). 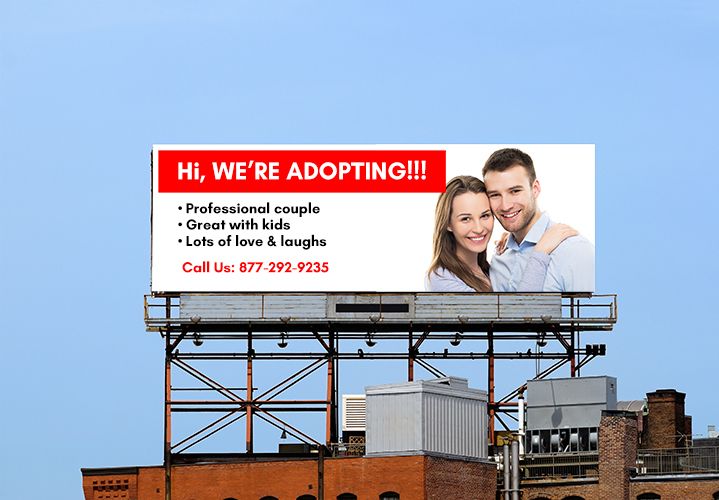 Advantages: This can be a great way to get your family in front of an audience that is interested in adoption. Connect platforms do a lot of the work for you, including all the outreach and marketing you will need to meet potential birth parents. Disadvantages: Connect sites generally require membership fees and can be expensive in their own right. The efficacy and quality of these sites varies greatly. So, do your homework. A lot depends on the amount of paid outreach a given service performs and how much quality traffic it can bring to your profile. Beware: with lots of outreach comes lots of scams. Last word: If you can afford the fees and don’t mind appearing with many families, this can be a great way to get in front of the desired audience. Be sure to select a service carefully, relying on professional recommendations, reviews, and even success stories. Advantages: Many claim that print advertising can still be effective. This can possibly be a good way to reach guardians, older parents, and others inclined to read publications such as PennySaver, etc. This option is good for families trying to cover all their bases. Disadvantages: When was the last time you read a newspaper? With no viable form of statistics or analytics for you to review, print advertising can seem like a shot in the dark. Last word: Unless budget is not a concern, it’s best to utilize other options. What about platforms like Pinterest, Twitter, or Snapchat? Every option has merits and may be worth trying. But given the time it takes to post regular updates and the fact that there are already other, more proven platforms like Facebook, it may not make sense to spread yourself too thin. While we’ve heard of connections happening on Craigslist or even through print classified ads, these occurrences are happening less and less frequently. With so many outreach options available to adoptive parents, it is easy to pivot and try plan B or C. Remember to keep an eye on the latest trends, but don’t discount the tried and true, either. Whatever methods you choose, go in wholeheartedly and give it your very best. You don’t want to look back later and wonder what might have happened if only you’d tried a little harder.